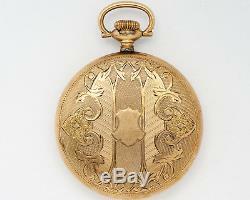 This is an antique Hamilton 16 size 23 jewel adjusted 950 pocket watch in a very nice swing-out case out of an estate! 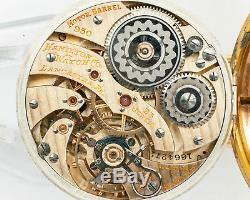 The lever set movement is marked: Hamilton Watch Co. Motor Barrel 950 23 Jewels Adjusted 5 Positions 1664272. The movement dates to 1919. The movement is not currently running, the balance staff doesn't appear to be broken, but the balance wheel does not rotate freely, and the watch does not wind. 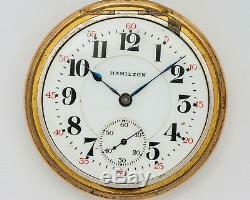 The double-sunk dial is marked: Hamilton. The dial is in great condition, no hairlines or chips in the finish! The watch is in an EXCELLENT Illinois Watch Case Co. The case is in great condition, showing only light scratches and no wear-through. 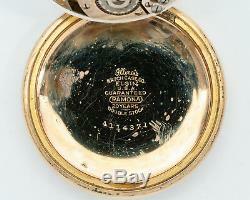 Inside the case back is marked: Illinois Watch Case Co. RAMONA Guaranteed 20 Years Double Stock 4114371. See all photos for condition please! We only sell guaranteed 100% authentic high end Swiss wristwatches and accessories. 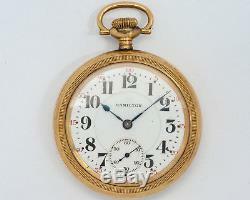 The item "Antique 1919 Hamilton 16s 23j Adj. 950 Pocket Watch with NICE Case for Restoration" is in sale since Monday, June 18, 2018.